Fresh off a string of failed romances, Elisha Tomlinson is making a new start. She’s got a great place, a new boyfriend and thinks she has left her past behind. But an unwelcome wedding invitation followed by a series of harassing midnight phone calls brings her newest relationship to the brink of collapse. To save her future, Elisha must confront her family and her past. But the consequences may be more than she can handle. When a young writer begins changing in ways that carry no scientific explanation, the situation eventually creates conflict in the relationship he shares with his longtime girlfriend. He is soon contacted by a shadowy figure claiming to have the answers he is looking for but the answers are not easy to believe when they involve spiritual posession and the laws of the dead. 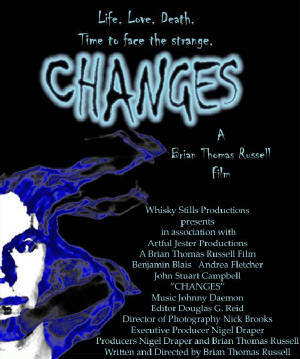 A film exploring the powers of faith, trust, and love, CHANGES is a supernatural thriller that puts a unique spin on the modern day ghost story. Brian Thomas Russell began acting at a very young age, performing in everything from school plays to imaginary movies with his friends. He attended the Etobicoke School of the Arts to hone his acting and technical theater skills and started to dabble with screenwriting at age sixteen, penning a total of twelve full feature length screenplays in four years. Following his graduation, Russell embarked on a quest to pursue his dream of becoming a filmmaker, during which time he performed and wrote for the stage with The Young Actors Performance Troupe, moonlighted as a waiter and video store clerk, and took on jobs on various film sets as a production assistant and locations support worker. It was a chance meeting with (then unknown) director Bryan Singer at the Toronto International Film Festival that solidified his desires. After striking up a conversation, Singer invited Russell into a screening of his film The Usual Suspects and later offered him some pointers on the industry. Singer’s words had a lasting impression on Russell and to this day, Russell credits Singer for being the first person to give him the confidence to drive forward towards his goals. Their connection would continue over the next four years, as they would meet again during a screening of Apt Pupil at the same festival two years later, and yet again during the pre-production stage of X-Men in Toronto. Russell signed his first production deal at age twenty, slated to write, direct and star in his first independent feature film with a modest budget of $500,000. Inner turmoil and disagreements between the producers within the company forced the company to go under and Russell’s deal went into turnaround. The next few years proved to be a serious uphill battle for Russell as he tried to get his film made, but he continued to take Singer’s advice to heart: “Don’t give up”. After numerous fits and starts, Russell decided to explore the options of self-financing his own work. In April of 2001, Russell began Artful Jester Productions and joined forces with Nigel Draper, an IATSE Local 873 member who was looking to break into producing. Draper patented Whisky Stills Productions and helped produce Russell’s first two short films: The Circle Game, a psychological thriller based on a feature script that Russell had previously written, and Changes, a modern day ghost story. They currently have three short films in development in addition to the feature length version of The Circle Game, the first in an arc of three films that detail the final decade of a fictional high school.